A statue of the late media mogul Ted Rogers was unveiled outside of the Rogers Centre before the start of Tuesdays Blue Jay/Dodgers game. Among being the man behind the Rogers Cable conglomerate, Rogers was also the majority owner of the Toronto Blue Jays from 2000 until his death in 2008; as well as the owner of the once called Skydome, now called the Rogers Centre. One cannot deny the impact that Ted Rogers has made on the Toronto Blue Jays in the past decade. Under his ownership Rogers helped increase payroll with the hopes of making the team competitive once again, and perhaps even return to post season play. Unfortunately despite the increased payroll the Blue Jays continued their streak of mediocre finishes culminating in a 2nd place finish in 2006. With all that being said… Ted Rogers DOES NOT DESERVE to be the first Toronto Blue Jay player, employee, or owner to have a bronze statue made out of them. 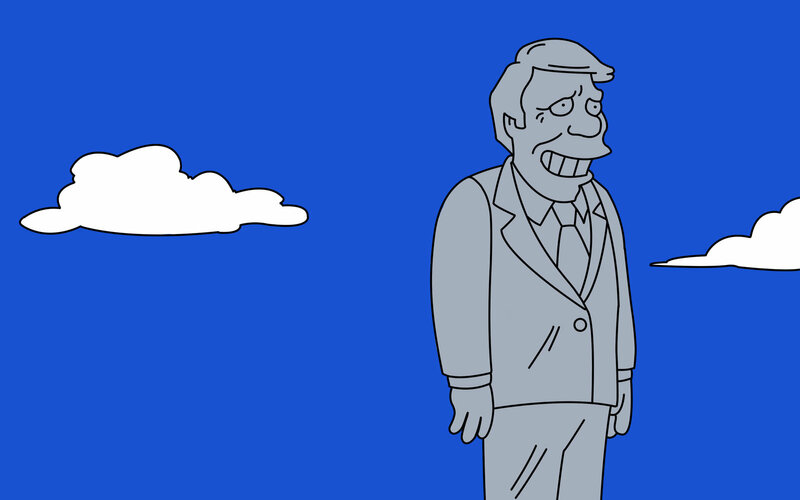 It’s similar to Springfield building a statue of Jimmy Carter. Not that Ted Rogers is historys greatest monster in anyway… well unless you are a Rogers customer. Ted Rogers was the owner of the team FOLLOWING an era that saw the Toronto Blue Jays rise to prominence in the AL and with back to back World Series titles. Under the Rogers regime, the Blue Jays have finished a collective 1044-1061 from 2000 until 2012. It should be noted that Rogers did do everything possible in order to make the Jays a winner again. It does not mean that he should be preserved in Bronze. I cannot understand WHY they decided to erect the statue to Ted Rogers outside of the Rogers Centre. Yes, I understand that he did own and name the building, as well as the on field product. But why erect it RIGHT beside the Dome?! Why not enshrine Ted Rogers outside of the ROGERS BUILDING which is located at ONE TED ROGERS WAY?!?!? The statues that should be built beside the Dome are ones that should honour the Blue Jays proud past and their World Series winning teams. I have always made the case for TWO statues to be built. 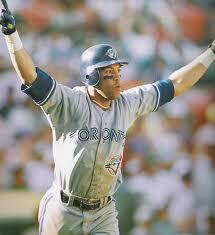 The first being Roberto Alomar celebrating his game tying home run in the 1992 ALCS against Dennis Eckersley and the Oakland A’s. The Alomar blast capped off a 5 run comeback in Game 4 and allowed the Blue Jays to come back and win in the 11th and take a 3 games to 1 lead against the A’s. In defeating the A’s, The Blue Jays were headed to their first World Series in franchise history. The second statue is no surprise. 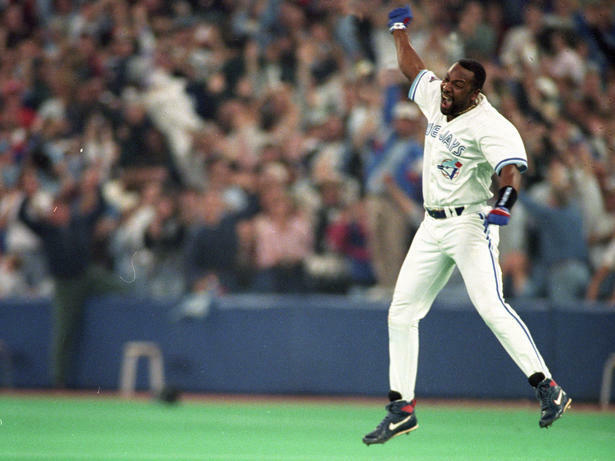 It should commemorate the most defining moment in Blue Jays baseball, and perhaps one of the best in baseball history – Joe Carters World Series winning, walk off Home Run. Can you honestly think of a better statue than that of Joltin’ Joe jumping around the bases (making sure to Touch ’em All) after blasting a 2-2 offering from Mitch Williams in to the LF bullpen?!!? How this has not been commissioned is an absolute shame. What makes it more surprising that the Blue Jays/Rogers organizations decided to build the Rogers statue instead of honouring their celebrated past is the fact that both 2012 and 2013 mark the 20th Anniversaries of their ONLY two World Series titles. It would be like The Yankees building a statue of George Steinbrenner ahead of building a statue of Babe Ruth. Owners DON’T win the games or titles! Yes they do play a large part in getting those wins by providing funds, but at the end of the day they are the people who sign the cheques, not get the W’s. When you visit Fenway Park you don’t see a 12 foot statue of Tom Yawkey or John Henry.. NO you see a 12 ft statue of Teddy Ballgame! Thats how it should be! Statues outside of ballparks and arenas should be their to honour the players, coaches, and even announcers… not owners. If the Jays/Rogers wanted to honour an executive or an “employee” why not Paul Beeston, Pat Gillick, or the late Tom Cheek? Beeston was the FIRST employee hired in Blue Jays history and is still the President of the team. Pat Gillick was the architect behind those power house Jays teams of the mid to late 80’s as well as the man who built the World Series winners in ’92 and ’93, he was also inducted into the Hall of Fame in Cooperstown last year. What about Tom Cheek, the voice of the Blue Jays? The man who broadcast 4306 consecutive games and is FINALLY being recognized with the Ford Frick award… why not him? 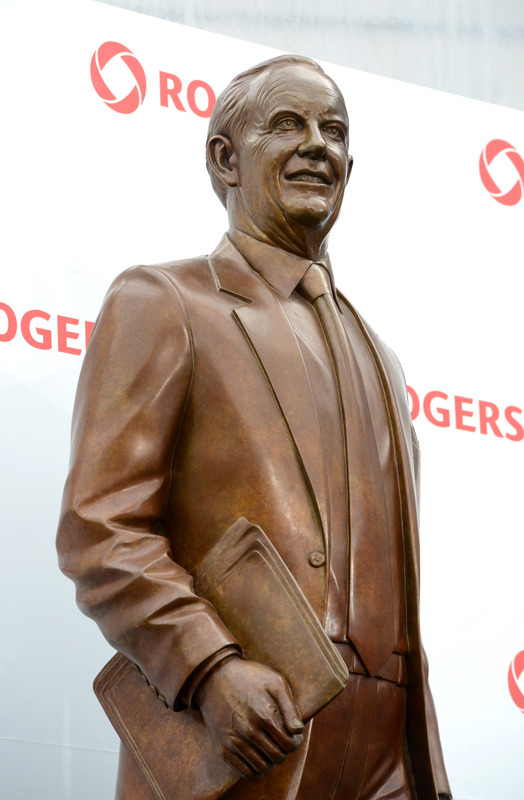 At the end of the day I understand WHY a 12 ft statue of Ted Rogers was built outside of the Sky..er Rogers Centre, I just believe that they could have built said statue at a different location OR waited until they honour players and team employees before rolling out the bronze bust of Ted Rogers. Ballparks are for the players and fans… Put it this way, as a Jays fan who are you looking to tell your kids about… Robbie Alomar, Joe Caarter, Carlos Delgado, and Roy Halladay? or the late great Ted Rogers? Beanballs and Bench Clearing Brawls: Where Does MLB Draw the Line? Aggressive base running, take-out slides, and the emptying of benches, overshadowed a game that saw Tigers starting pitcher Max Scherzer win his thirteenth game of the season, and become the first pitcher since 1986 to start their season 13-0. Scherzer, who was staked to an early 4 run lead, cruised through 6 2/3 innings while striking out 8 Jays batters. Unfortunately it would be a hard, take-out slide by Colby Rasmus in the 4th inning, and a pitch off of Torii Hunter’s left shoulder that would be the post-game focus. Rasmus, who is often praised for his hard style of play on the bases, slid cleats first into Omar Infante while trying to break up a double play. Infante was hurt on the play and forced to leave from the game with what is being called a shin contusion; he will be re-evaluated on Thursday. It should be noted that Rasmus was advancing to 2nd, following being hit by a pitch during his at bat by Max Scherzer. Keep that in mind. Two innings later, newly recalled Todd Redmond would plunk Torii Hunter with a 91 mph fastball on his lead shoulder. Hunter was visibly irate about being hit, and immediately headed toward the mound to have some words with Redmond. Although both team’s benches and bullpens would clear, cooler heads would prevail and the rest of the game would end without incident. Just part of the game… That’s the argument that is used when defending aggressive and borderline dirty plays in baseball. It’s a similar argument to the age old “boys will be boys” defense. But when does that defense become archaic and in need of update? Does it take a career ending injury? Does it take an ugly brawl? or will it be something much worse? Even in today’s game fans love players who play with an edge, we love the fact that these guys are willing to do whatever it takes in order to score a run, or get a win. Unfortunately for baseball it becomes a case of both wanting the cake, as well as eating the cake. What I mean is, as fans we want players who are willing to go that extra mile in order to ensure a win, but we want to make sure that they don’t go TOO far outside the lines in order to do so. We love the concept of that “throwback” player, the guy who aggressively breaks up double plays, who plays with no regard for their body; or anyone else’s. With baseball it’s hard to escape the “just part of the game” mentality because the history of the game is rife with players and moments that define the “whatever it takes” mentality. Flip through any book on the history of the game and you will get a quick education on brush back pitches, sliding cleat high, different ways of doctoring baseballs, and other blatant ways of cheating (see PED’s). Drysdale would know a thing or two about the brush back pitch; his 154 hit batters is still the N.L record. The brush-back pitch is still a widely used tactic when it comes to both pitching strategy and policing of the game. Throwing inside or up and in is not just reserved to getting control of the inside corner, but also as a tool for personal revenge. This season just reached the halfway point and we’ve already had two bench clearing brawls that resulted in injuries and lengthy suspensions. In April, Carlos Quentin charged the mound after being hit by a pitch from Zack Greinke. In doing so, Quentin tackled Greinke causing Greinke to fracture his collarbone. Quentin received an 8 game suspension and Greinke missed roughly a month recovering. It should be noted that Greinke had hit Quenitn on more than one occasion in the past. However this time around it would appear that it was more unintentional than intentional. Greinke was protecting a one run lead with the tying runner on base, and he was ahead of Quentin in the count. Furthermore, Greinke hit Quentin with a breaking pitch. It’s common knowledge that you don’t intentionally throw at a batter when you’re ahead of him in the count, and you don’t use a curveball to do so. 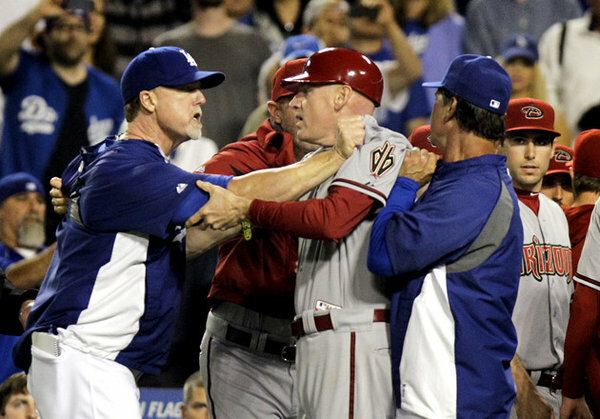 It wouldn’t be the only time Greinke was involved in a “bean ball” incident though. 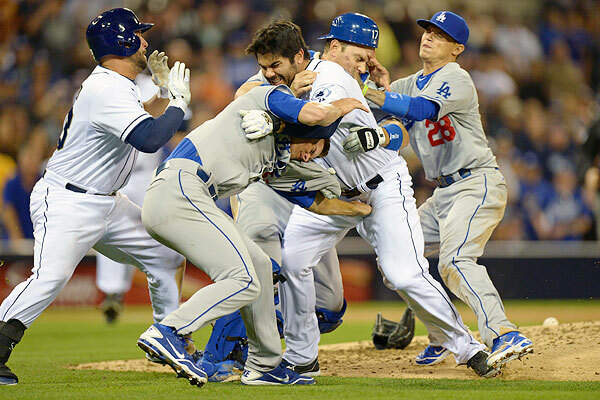 Two months to the day (June 11th) of the Quentin incident, Greinke was plunked near the head by Diamondbacks pitcher Ian Kennedy, Kennedy then hit Yasiel Puig in the head which led to another bench clearing brawl. Luckily there were no injuries this time around, but there were some suspensions handed out to players and coaches. Kennedy would receive the lengthiest of the suspensions handed out (10 games). Perhaps this was because Kennedy threw not at one, but two batters, and mainly their heads at that. Another thought is that it could also do with Kennedy’s reputation for hitting batters; Puig was Kennedy’s 41st hit batter since 2010. Mesa lived up to his promise, as he beaned Vizquel in each of the next three times he faced him. It wasn’t until the 3rd beaning of Vizquel that MLB suspended Mesa for 4 games; Mesa also subsequently announced the feud as over. Basically he hit Harper because Harper, a rookie, had shown him up. 30 years ago that would be common practice, today it warrants a suspension; Hamels was suspended 5 games. In keeping with the unwritten rules of the game, following Hamels plunking of Harper, Nationals pitcher Jordan Zimmermann also intentionally hit Hamels with a pitch when Hamels came up to bat. You hit one of my guys… I hit one of yours. Rasmus’ take out slide to break up the double play tonight was aggressive, but compared to the way the bases use to be ran; it was fairly tame. 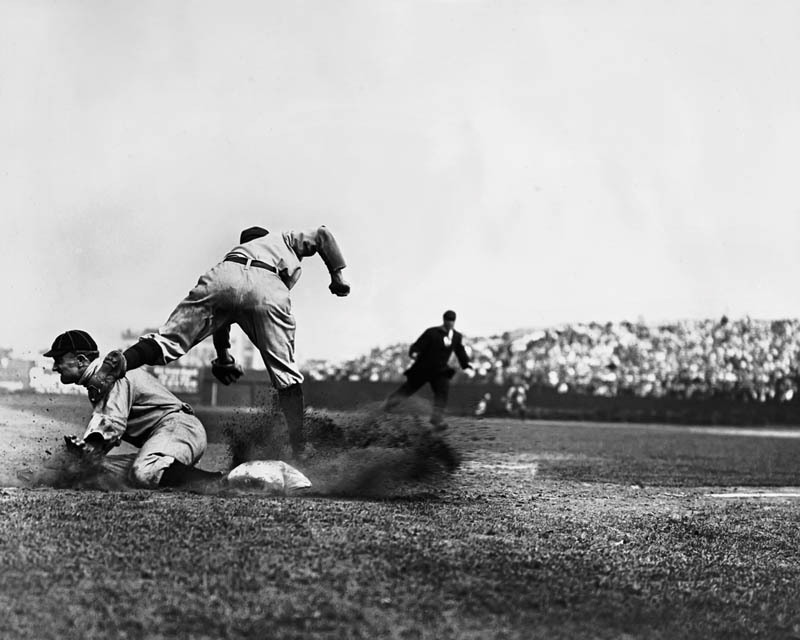 Aggressive running on the base paths have been documented throughout the game and goes all the way back to the beginning of the Modern era of baseball; the Deadball Era. Back in the days before the home run was king, a bunt single and two stolen bases was the way the game was played. Players also took advantage of only having one umpire and would slide cleats high into the base in order to jar or force the ball loose. 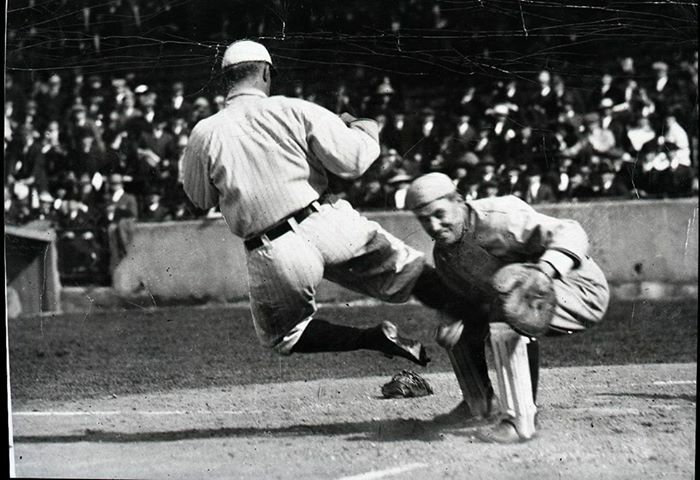 There was no one better at this than the great Ty Cobb (another Tiger… shocking). Take out slides like the one Colby Rasmus performed tonight are an integral part of how the game is played. They are a last ditch effort to break up a potential double play. It’s a play that EVERY team uses, and is probably seen multiple times in each game played. The whole purpose of a take out slide is EXACTLY what it sounds like; to TAKE that player OUT of the play. Yes it is a dangerous aspect of the game, but so is blocking for a running back in football, and blocking a shot in hockey. Breaking up double plays by using a take out slide is a fundamental part of base running. However, you never want to slide to injure the opposing player, but it will happen occasionally. Tony Fernandez had his 1987 season ended when Bill Madlock broke his ribs on a take out slide. 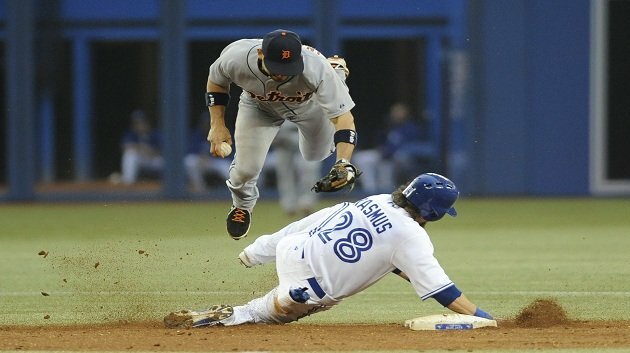 Personally I think that Rasmus was late on the slide, and shouldn’t have slid at that moment. I don’t believe he intended to hurt Infante intentionally, I do however believe his wholehearted intent was to take Infante’s legs out from under him. It should be noted that Rajai Davis was the player who hit the ball and the Tigers probably wouldn’t have turned the double play anyway. An unfortunate play, but a baseball play none the less. The aggressiveness of the take out slide can be thrown in the same category as “railroading” the catcher at home plate. You’ve probably all witnessed one while watching the morning highlights. The most infamous example was Pete Rose running over Ray Fosse during the 1970 All Star game.Rose ran right through Fosse, who was blocking the plate, in order to score the game winning run. As of 2012 the Giants front office has told Posey to refrain from blocking the plate in order to keep him from a potential career ending injury. Perhaps this is a move more teams should employ. I mean for every Pudge Rodriguez holding off a charging JT Snow, we have Buck Martinez and his horrific 9-2-7-2 double play. One of the most notorious ways of getting a little “competitive edge” is by doctoring the baseball. Before 1920, it was legal to throw a spitball, in fact many pitchers threw a variant of the “spitter”. Unfortunately it would take the death of Indians SS Ray Chapman, who was struck in the head by a spit ball thrown from Yankees pitcher Carl Mays, before MLB outlawed the spit ball. This rule was grandfathered into the rule book which meant that any active pitcher who was still throwing the pitch could still throw the pitch until the retired. Seventeen pitchers in total were still allowed to throw the “spitter,” Burleigh Grimes would be the last of the group to throw it; he retired in 1934. Now just because the spit ball was outlawed 90+ years ago does not mean modern day pitchers adhering to the rule. 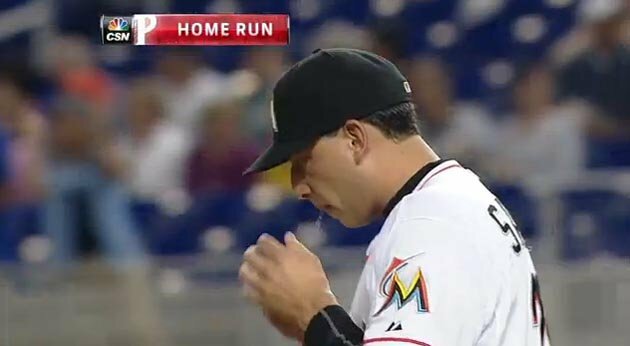 In May of this year, Miami Marlins pitcher Alex Sanabia was caught on camera openly spitting on the baseball while on the mound. The umpires of the game did not notice and Sanabia was surprisingly NOT suspended by MLB. 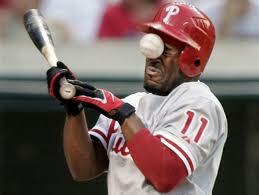 He did have a good excuse though; he apparently DID NOT KNOW that it was ILLEGAL to SPIT on the baseball. I guess it’s hard not to know a rule that has been around longer than Yankee Stadium (old and new). Spitting isn’t the only way that pitchers have “doctored” balls. Pitchers will use just about anything in order to get a little more drop on their breaking pitches, or movement on their fastballs. One of the more traditional ways is by applying some vasoline or pine tar to the ball before delivering the pitch. Clearly pitchers aren’t just strolling to the mound with a travel size jar of Vasoline, instead they hide it in the brim of their hat, inside their glove, or elsewhere on the body. Pitchers have also been creative and started to use K-Y, Vagisil, and shaving cream in lieu of pine tar and petroleum jelly. Doctoring a baseball is considered an “art,” and is prevalent through the history of the game, and still practiced today. 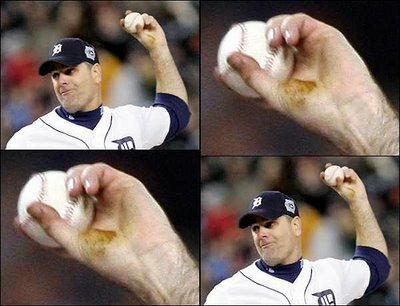 In Game 2 of the 2006 World Series between the Tigers and the Cardinals, camera crews caught a brown substance on the pitching hand of Tigers pitcher Kenny Rogers. Over the course of the inning announcers Joe Buck and Tim McCarver openly discussed the substance on Rogers hand, and upon closer examination it was revealed to look like pine tar. Instead of setting the hounds loose, Cardinals skipper Tony LaRussa nonchalantly asked the umpires to have Rogers wipe his hand clean. If he wanted, LaRussa could have had an investigation on the field happen, and perhaps Rogers would have been ejected from the game and received a suspension. Instead he said nothing. Perhaps because the Cardinals pitchers were also doctoring the ball, and he didn’t need the additional focus on pitchers hands. That’s just my opinion though. Even as recent as May this year there have been more allegations of pitchers using foreign substances to load the ball up. 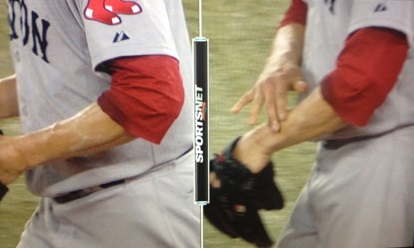 In a game against the Blue Jays, Red Sox pitcher Clay Bucholz was caught touching a “sticky and shiny” substance on his non pitching arm and then proceeding with his pitch. “What do you think? Look at the pitches. Fastball at 94 that goes like that,” his hand darting swiftly down and away. “On a fastball? In hockey, concussions have eliminated any type of hitting to the head. This is in a sport that just over a decade ago was praising the likes of Scott Stevens, and whose main take home media is called Rock em Sock em. If Stevens played today, he would be considered a serial killer when it comes to hits to the head. Pro football can echo that sentiment. The NFL is having a harder time trying to make their game safer. In a sport where players collide with near-car crash results, it’s increasingly hard to slow the game down in order to make it safe. In the past decade the NFL has taken drastic steps to better protect the Quarterbacks, as well as the ball carriers and receivers. Defensive players are the ones who pay the price now, as they can be penalized and fined for any hits near the head, as well as any second late hit on the QB. You can’t blame the leagues for doing more to protect the short and long term health of their players. It’s no secret that today’s athlete is significantly faster and stronger than athletes in the past. The problem is when you take these athletes and put them in a sport that hasn’t been modified in 50+ years. Of course guys are going to have more injuries when they’re getting hit by faster and stronger players. Players breaking up double plays and railroading the catcher are SIGNIFICANTLY bigger and faster than players playing in the 50’s and 60’s. Just like players in the NHL and NFL are SIGNIFICANTLY bigger and stronger. As much as we love to see players going out and giving their all on every play, you have to remember that there is more going on than just a hard slide at 2nd or a pitch moving up and in on a hitter. As long as we lobby for modern day players to play a gritty, old school style of play, we’re going to have an increasing amount of injuries. I believe that pitchers should be able to work inside to batters; I believe that they should be able to plunk a batter occasionally too. It’s no different than my belief that the NHL needs enforcers and fighting in the game. Players will police themselves better and play with more respect if they know that they might wear a 90 mph heater in the ribs if they get out of line. Baseball has shown in the past that it can take a firm stance and outlaw a practice that could be detrimental to their player’s health. But even though they made the spitball illegal, it didn’t stop people from using it. Even in the game today it is still being used. It’s impossible to ban pitchers from hitting batters, and players sliding hard into bases, without completely remodelling the way the game is played. The best thing that the MLB can do is to continue to fine and suspend players who breach these rules. I know there haven’t been suspensions for hard slides yet, but that is something they could look at in the future. I know MLB has their plates full with all this biogenesis nonsense, but they should still take a look at how they can ensure player safety on the field, while not taking anything away from how the game is played. A few final thoughts in respect to tonights game: Although I sympathize with Jim “Marlboro” Leyland and the Tigers, I do hope that they will be a little more hesitant before calling players dirty in the future; especially with their colourful past and present.